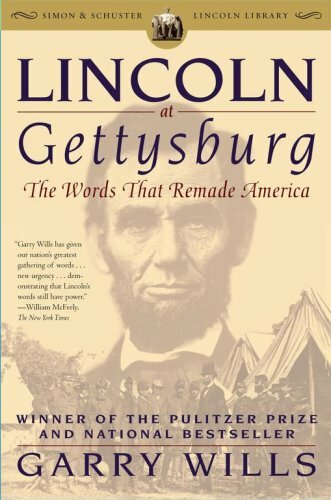 Great Nonfiction: Lincoln at Gettysburg, by Garry Wills | You're History! There are times in every nation’s history that serve as turning points, and the 1863 dedication of the Gettysburg Cemetery is one of America’s, largely due to the influence of Abraham Lincoln’s 256 word speech. Garry Wills puts paid to the notion that Lincoln dashed something off on the train ride to Gettysburg, painstakingly tracing the cultural, literary, historic, and philosophical underpinnings to one of the world’s oratory masterpieces. Wills also analyzes the surviving five drafts of the speech that were written in the President’s own hand, concluding that the one given to Alexander Bliss is most likely the one from which Lincoln spoke. He also attempts to pinpoint the location of the dais within the cemetery, which was not, as the Park Service contended, at the site of the Soldiers’ Monument. Readers searching for information about Lincoln’s activities on that fateful day will find little of interest in this slim volume, but for those interested in the best known address in American history, Lincoln at Gettysburg fills the bill.